Holly Holy Day in Nantwich, the preseason unfriendly as it is sometimes called, is the first battle of the year. It give us a chance to meet with fellow members of the Newcastle’s Foote and friends from other Sealed Knot regiments. This weekend we’re going to be taking part in our next event. You’ll find us taking part in Wakefield Armed Forces Day, held at Pontefract Park, next to Pontefract Racecourse. 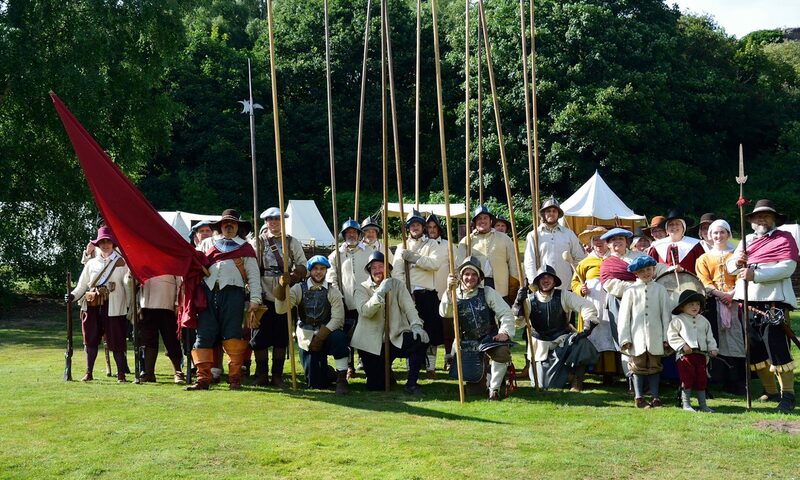 We’ll be setting up our Living History camp and will have a range of people for you to come and meet, both portraying military and civilian life in the 17th Century. Hello, hello! We’re back again after a bit of a blog hiatus, sorry about that! We’re all back on track and will be keeping you updated with what we get up to over the Summer. As you’ve probably worked out, we don’t do a great deal of fighting over the winter. To keep our blog ticking over, we’re going to write about a range of topics including wider 17th Century history, more information about the members of our regiment and other interesting things we think you might like. To kick this off, Simon Wright from our Regiment has written all about the colours of the English Civil War. The colours were one of the most prized possession of a regiment and were carried onto the field by the Ensign, a junior officer of the regiment.